Ian Hardman (right) supports a strong run by Misi Taulapapa in Featherstone's win against London last Sunday. Picture: Carol Austerberry. Full-back Ian Hardman will continue to captain Featherstone Rovers. Hardman took the role when new skipper Misi Taulapapa was unavailable because the former Samoan international centre was awaiting visa clearance. Hardman captained Rovers in last Sunday’s 38-18 victory over London Broncos when Taulapapa made his first appearance this season. 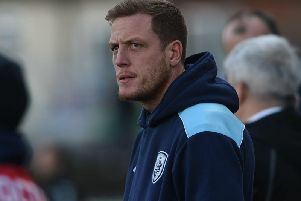 Rovers coach Jon Sharp said: “Ian will stay as captain - he doesn’t deserve to lose that. “He’s worked really hard at it and he’s been a big success. “Misi needs to concentrate on his game and he doesn’t need any distractions. He just needs to get back playing and focusing on his own role.